You are at:Home»News»Rowing team update: Elettra sandwich! Having not quite kept up with other gigs at our own event , overall we are now creeping up the ladder! Ladies – A good start, with Elettra held on the tail of a close pack and held ahead of Audacity (Wivgigs) to halfway (They had very sportingly loaned us one of their ladies to add to our 3), unfortunately we then slipped back finishing 13 / 13, but at least we raced! Men’s – A good start put us right in the mix, unfortunately a little too good – putting our nose over the line (so 30 secs penalty)! An exciting race with lots of gigs abreast coming in to the earlier turns, Elettra had a competitive tussle with Ready (Maldon) calling water on the first turn, and us having to call up water to their sister ship Record Reign (Maldon), we had a close, gentlemanly, exciting race and re-took Ready. Unfortunately during a competitive and tight turn by us Ready managed to clip our tiller quadrant, but we managed to jury rig a thole pin, kept going and just beat them on the water. A friendly protest for our tiller gave Ready a 30 sec penalty, so we continue some friendly rivalry. We were 12th out of 15. 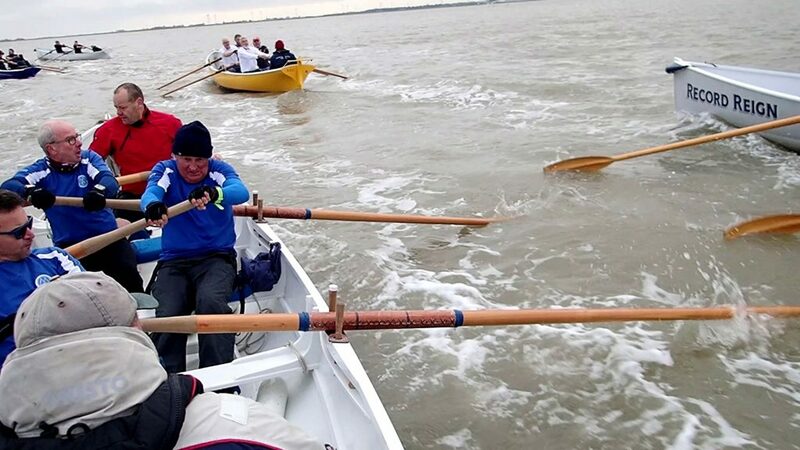 Mixed – We were kindly loaned a man from Mersea and our ladies Christina & Jas rowed for their second time of the day. Larry as Cox had to work hard with the thole pin rig rather than the proper tiller making Elettra less manouvreable. Wfinished 12/14. So overall in the series we can’t be last! Huzzah!…. and I’ve got some surgery to do to repair Elettra’s Tiller Quadrant! Now there’s something you don’t read every day! 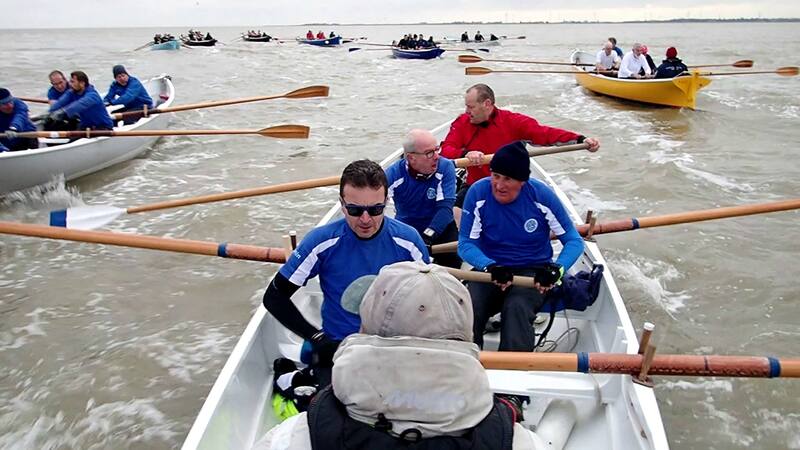 Mersea Mens Race: Elettra Sandwich. 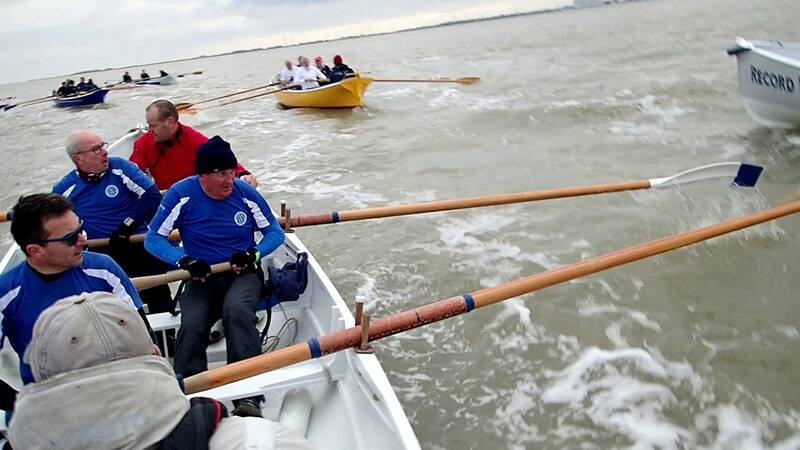 This short series of 3 pictures shows us sandwiched between Ready and Record Reign, having to pull in oars, our crews’ faces say it all about the tension of the moment and the hard work rowing at that pace as we were also hitting the swell of open water on the turn.